The interleaf toilet tissue dispenser in durable ABS plastic is a great hygiene solution for restrooms. Featuring a handy ‘window’ so you can see how much toilet paper is left, the dispenser releases toilet tissue in interleaf format to reduce unnecessary wastage and save space. 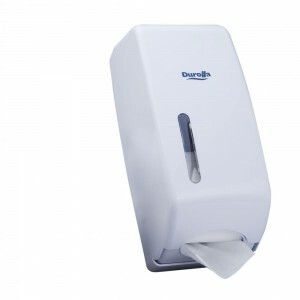 It is suitable for use with the 245CW Ultrasoft toilet tissue.